Our Cocoa Pawn Shop will probably be closing up Thursday and Friday due to Hurricane Matthew. However, we are open today so if you need generators or cash please come in. We will give you 10% pawn loan, so come drop off your stuff get cash and pick it up next week only paying 10% more. How can you go wrong? Stay safe! We have purchased ads using google.com/adwords to buy ads for people searching "cocoa pawn shops" as you can see with the attached picture. 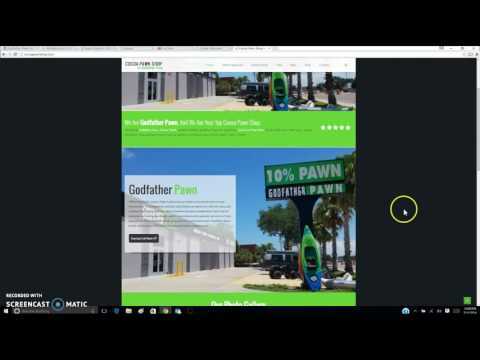 Our web company IDrive Media Group helps us target customers and get more visitors to our website not only for Godfather pawn and top spot Orlando Pawn shop, but soon Cocoa Pawn Shop. How Do You Buy A Gun From Cocoa Pawn Shop? The process is pretty simple. You come in and pick a gun you like. You leave a 20% deposit on your gun. We have to hold your deposit and application for 3 business days. On 3rd business day you can come in and we run the background check over the phone. This will cost you $5 to do. Once approved through background check you can complete purchase for the gun. We have a wide variety of new and used guns at our Cocoa Pawn Shop. Come by Today or Call! stolen items at pawn shop.